The ozone layer is located high up in our atmosphere, in a layer known as the stratosphere. Stratospheric ozone is critical to human life because it absorbs harmful UV radiation, reducing our risk of skin cancer and other ailments. However, ozone levels have been depleted by anthropogenic emissions of chlorofluorocarbons (CFCs), which were banned by the Montreal Protocol in 1989. The Montreal Protocol has now been ratified by all 197 members of the UN, including the United States. This is one of environmental policy’s greatest success stories: not only did countries around the world unite to solve a global problem, but the treaty seems to have actually worked. Today, the ozone hole is beginning to show signs of recovery, although this outcome was not immediately clear, as the ozone hole continued to worsen throughout the 1990s and much of the 2000s. We may now know at least part of the reason why: a recent study by Wilka et al. indicates that the effects of the Montreal Protocol may have been delayed as a result of volcanic eruptions. Wait, volcanoes? Weren’t we talking about ozone? Volcanic eruptions can actually impact the ozone layer if they’re strong enough; that is, if they blast gases (such as sulfur dioxide) and volcanic particles so high that these particles manage to reach the stratosphere. Eruptions of this strength are relatively uncommon; one example is El Chichon (the title image for this post), which erupted in 1982. Mount Agung, whose 1963-64 eruption also resulted in ozone depletion. Image Credit: Wikipedia. Ozone is depleted by a catalytic reaction involving a chemical called a chlorine radical. However, chlorine doesn’t usually enter the stratosphere in this radical, or active, form. Instead, chlorine atoms usually reside in compounds like HCl or ClONO2, which are known as reservoir species because they contain chlorine but don’t deplete ozone. It’s only when these reservoir species undergo chemical reactions that activate chlorine, or turn it into its radical form, that ozone can be depleted. It turns out that the chemical reactions which activate chlorine, making it dangerous to ozone, run much faster when they can occur on some kind of surface. Near the South Pole, polar stratospheric clouds can provide such a surface, which is why there is such a dramatic ozone hole there. Stunningly beautiful, stunningly destructive. Polar stratospheric clouds at McMurdo Station, Antarctica. Image Credit: Wikipedia. But back to volcanoes. 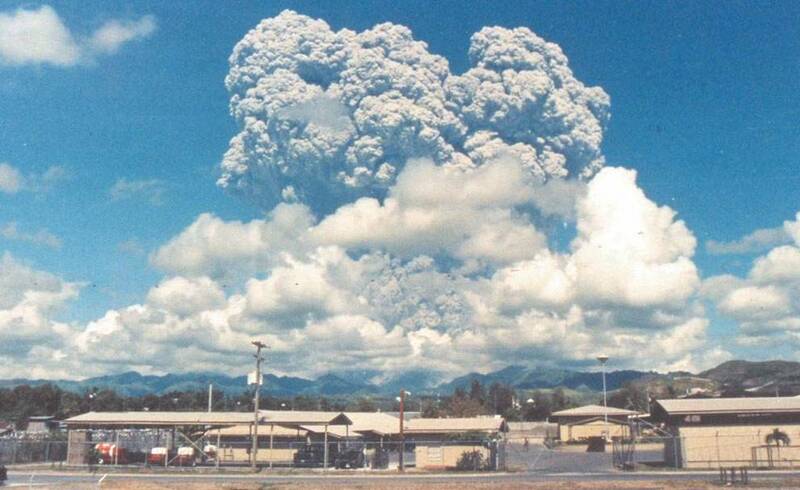 Some of the strongest eruptions, like those of Pinatubo, El Chichon, and Agung, were powerful enough to fling particulate matter all the way up into the stratosphere. This matter provided a surface upon which chlorine could be activated, which led to ozone loss. How big are the volcanoes’ effects? This is the question that Wilka and her collaborators set out to address. They used a computer model called the Whole Atmosphere Community Climate Model, or WACCM for short. (Yes, that’s pronounced as “wack ’em”.) WACCM is particularly useful for studying ozone because it incorporates both atmospheric dynamics (the movement of air) and atmospheric chemistry (chemical reactions that occur in the air). This means that you can give WACCM a description of the chemical compounds and particles that exist in the atmosphere, and WACCM will calculate how much ozone will be depleted as a result of these conditions. Satellite observations of the Antarctic ozone hole in 2006, when it was largest. Image credit: Wikipedia. Wilka and her collaborators ran WACCM under several different scenarios. Each scenario was a careful reconstruction of atmospheric conditions since 1979, but with a twist: some of the scenarios excluded the effects of volcanoes and certain kinds of atmospheric chemistry. By comparing the WACCM results from each of these scenarios to a control simulation and to satellite observations, the team succeeded in isolating the effects of volcanoes and certain kinds of chemical processes. They found that more ozone was depleted in the aftermath of volcanic eruptions, indicating that volcanic eruptions may have slowed the rate of ozone recovery since the Montreal Protocol was adopted. In particular, the eruptions of Pinatubo and Cerro Hudson in the early 1990s appear to have added so much particulate matter that the recovery of ozone as a result of the Montreal Protocol did not even become obvious until 2014. According to Wilka et al., the effects of the Montreal Protocol are expected to be most obvious during decades that are volcanically quiescent, or relatively eruption-free. Pinatubo (left) and Cerro Hudson (right). Image credits: Wikipedia. The Montreal Protocol made history in 1987, when it was the second universally ratified treaty in UN history. It was the result of international cooperation in service of a common, scientifically-backed goal: reducing the emissions of ozone-depleting substances, including CFCs. Research from scientists throughout the world have shown a range of dire consequences if the Montreal Protocol had not been passed. A second ozone hole might have opened up over the Arctic, hurricanes might have become much more intense, regional climate change might have been enhanced in polar regions, and the entire ozone layer might have collapsed by the latter half of this century. Studies like Wilka et al.’s demonstrate that, while random variability and volcanic eruptions may mask the beneficial effects of the Montreal Protocol, it is working, and nations have good reason to take their Montreal Protocol commitments seriously.